After a long day of sightseeing, the best way to refresh yourself is to take a dip in a swimming pool or in the sea. Even though Athens has its splendid Riviera, choosing a hotel in the center for convenience means long taxi rides to the beach. 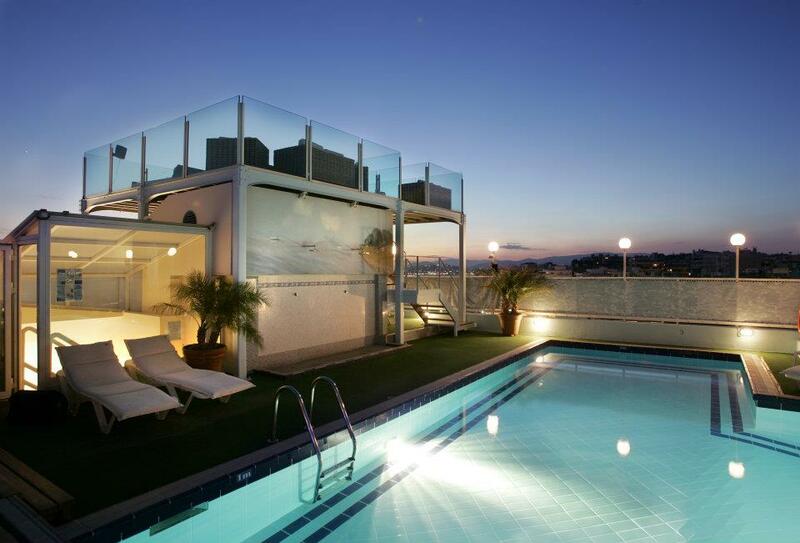 The best alternative is a rooftop swimming pool, so you can take in the views as well. 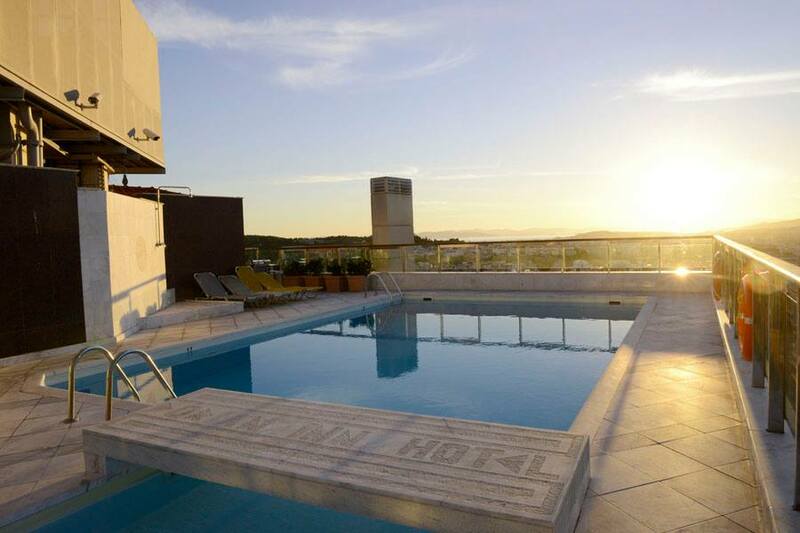 Lucky for you, here is a list of the top rooftop pools in Athens, Greece, so you too can enjoy your holiday to the fullest. Located a 20-minute walk from the Acropolis, and near Plaka and Monastiraki square, Fresh Hotel is the ultimate urban resort in Athens. 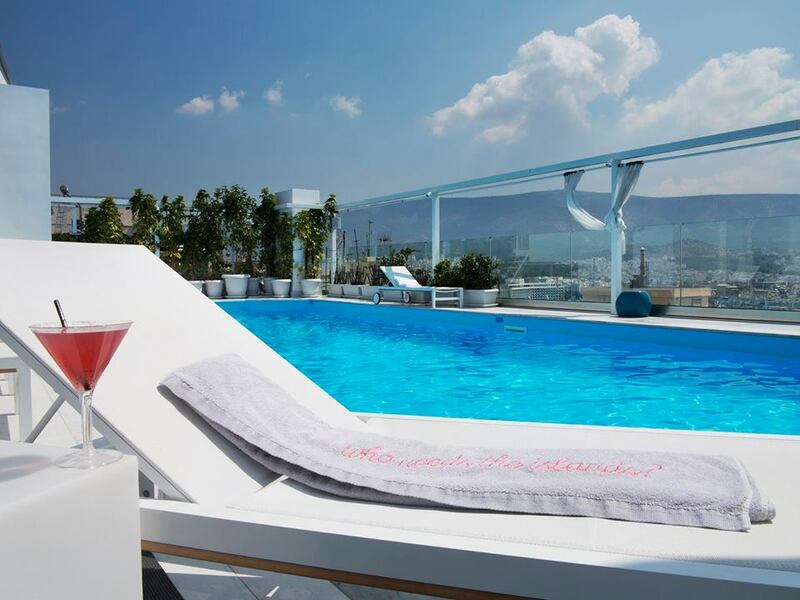 With a minimalist décor and bright colors, the hotel has a restaurant-bar on the ninth floor, as well as a rooftop pool from where you can enjoy all-encompassing views of the center of Athens. Relax on the sun beds while sipping on a delicious cocktail as the sun sets over the city. You will never want to leave this place. Conveniently located near Omonia square on Pireos street, the Dorian Inn Hotel is a relaxed and friendly hotel. Besides its central location and great breakfast, its bonus point is undoubtedly the rooftop pool, from where you can enjoy uninterrupted views over the city, an ideal spot to relax from the ancient city’s hustle. 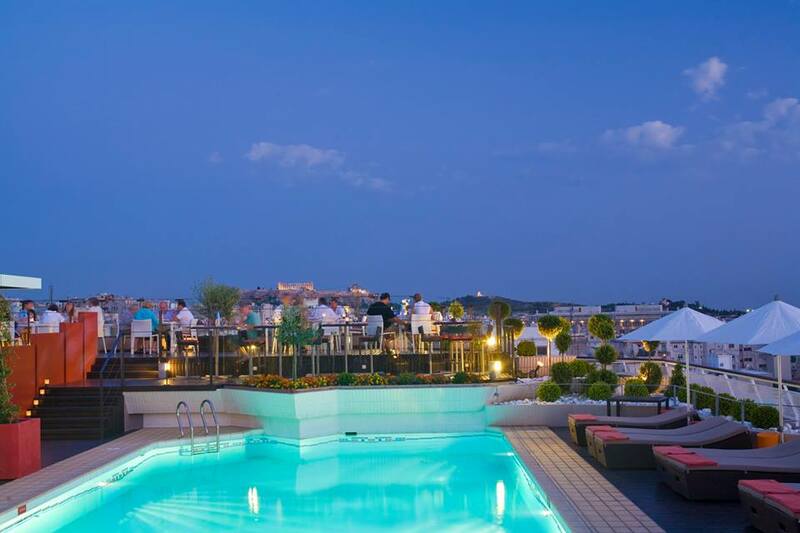 Located in the center of Athens, the four-star Novotel, with its rooftop pool, is another place to refresh yourself after a long day exploring the city. You can even have your dinner in the rooftop restaurant, which enjoys majestic views of the Lycabettus hill, and the Acropolis. Set in the heart of Plaka, the Electra Palace Hotel is an elegant hotel with classic décor set in historic buildings. 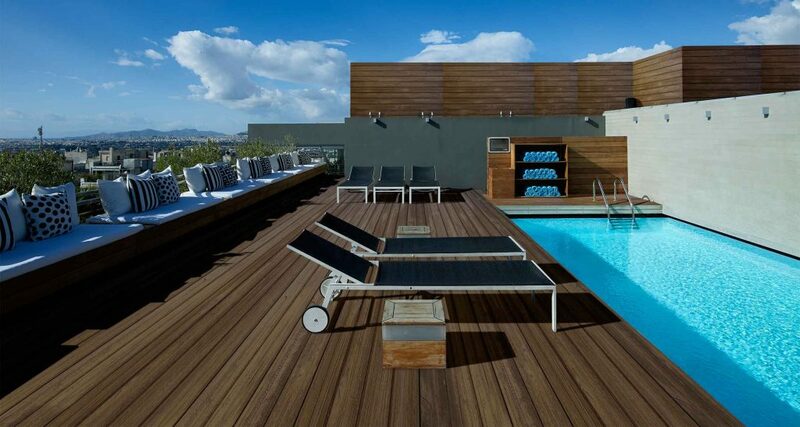 The outdoor pool, perched on the fifth floor of the hotel is set to be an urban oasis. 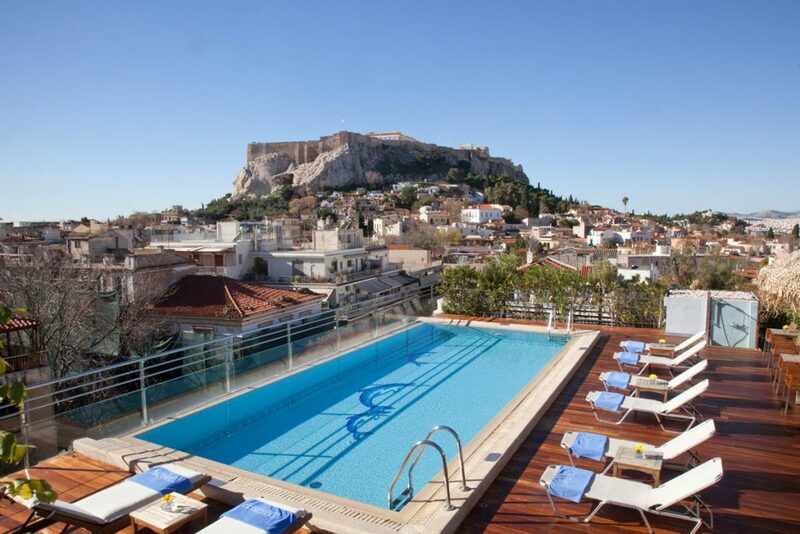 Offering views of Plaka and the Acropolis, the pool features a bar where you can relax at the end of the day. 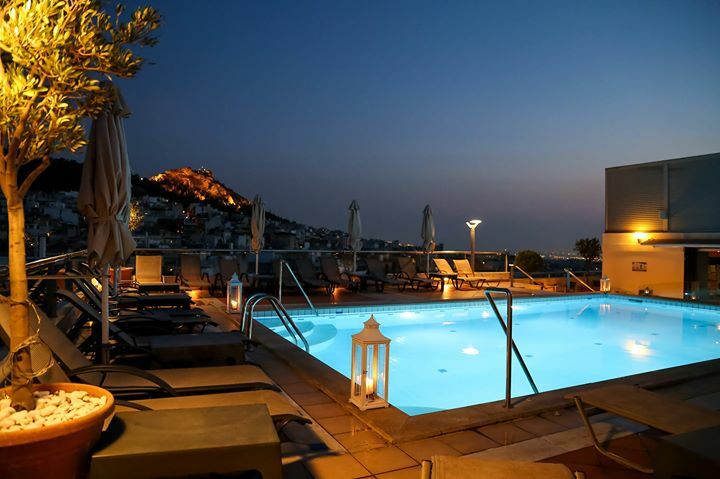 Located on Alexandras Avenue, Zafolia Hotel is a humble hotel offering spectacular views over the Lycabettus Hill. Its rooftop, which includes a bar and the pool, is therefore very refreshing and allows the guests to relax and take in impressive views of the verdant hill. Just grab your towel, order a drink at the bar and simply relax by the pool. You are on holiday after all. Wyndham Grand Athens is an underrated hotel near Metaxourgeio. While this may not be a popular area in the city, the hotel is worth a try. Especially the rooftop, with the restaurant/bar Above, which serves delicious Mediterranean cuisine and has views from the Acropolis, the Lycabettus hill and all the way to the Saronic Gulf. The pool next door may be your next favorite place, as you settle comfortably on your deckchair under the stars. For a breathtaking view of the Acropolis and Lycabettus Hill, St. George Lycabettus Hotel is the place to be. Granted, the pool may not be the biggest we have selected, but the rooftop garden largely compensates for the size of the pool, with a mini-fitness center and sauna and a pool bar. A perfect spot to enjoy a cool breeze after an exhausting day of sightseeing. Located on Kifissias avenue, President Hotel is a luxury hotel between Panormou and Ambelokipi metro stations, in a residential area. While it may not be close to the main ancient attractions, its location allows for unique views over the city. 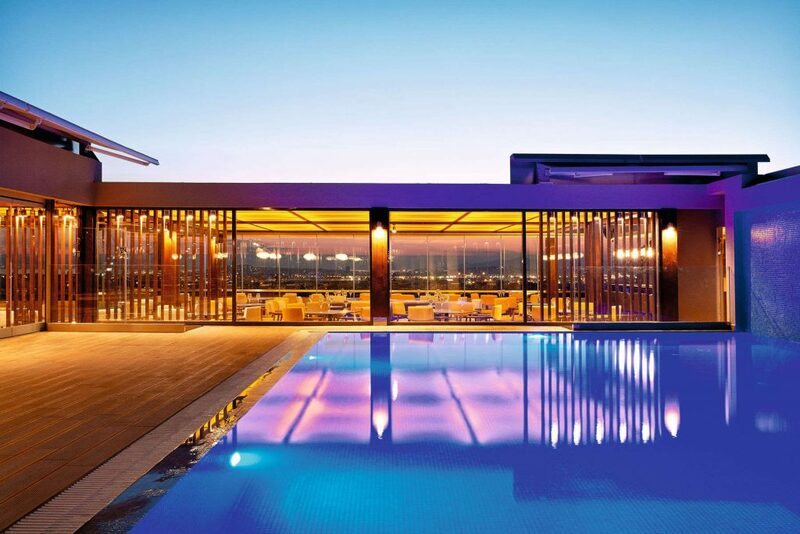 So climb up to the rooftop bar and pool, order yourself a drink and take it all in. Peering over Hymettus mountain is just so relaxing, especially when you have a glass in your hand. Offering luxury rooms and suites in Athens, the Divani Caravel Hotel is located in the Evangelismos district, near the eponymous metro station. Knowing how to mix elegance and luxury, the hotel has several facilities worth noting, including its indoor/outdoor pool with views over the city and its many bars and restaurants. 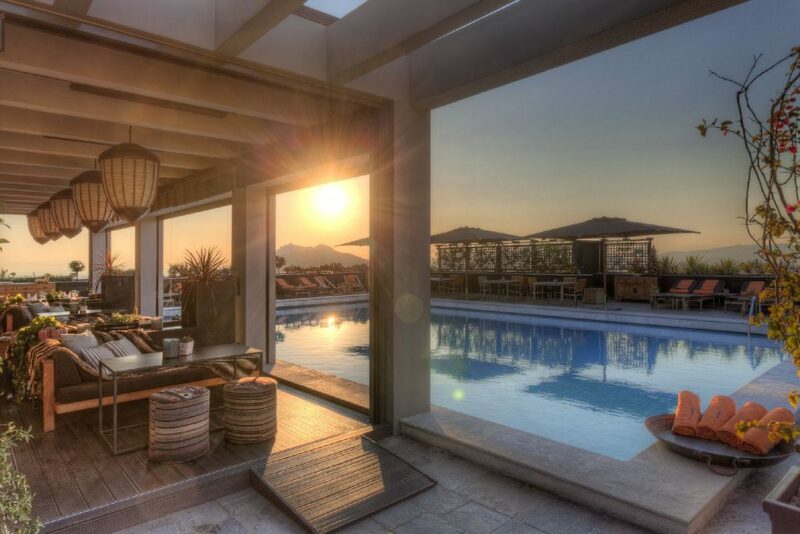 Let your stress melt away with views over the Acropolis and the Lycabettus hill and enjoy a relaxing drink poolside. Forget the city and head to the beach instead. If you prefer to be near the water, then Poseidon Athens Hotel is just what you need. Overlooking the Saronic Gulf, the hotel is located on the seaside, on Poseidonos Avenue. As such, from the rooftop pool you get unobstructed views over the deep blue sea, which really helps to set you into a holiday mood from the start. Plus you are near Piraeus port, should you plan on visiting a few islands while you are at it.